What the inside looked like before we tore it all out. Final circuit board design. Had headers for other devies that were planned for the oven, including a OLED screen and rotary encoder. 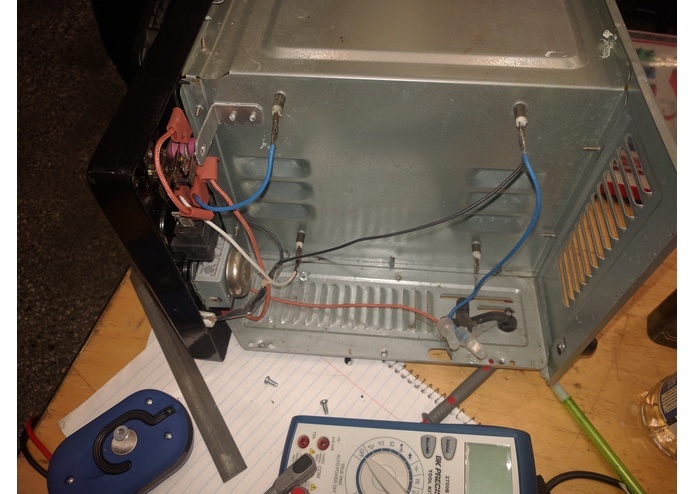 SMT Reflow Oven is a consumer toaster oven that has had all of its original circuity removed and replaced with an inexpensive micro-controller. 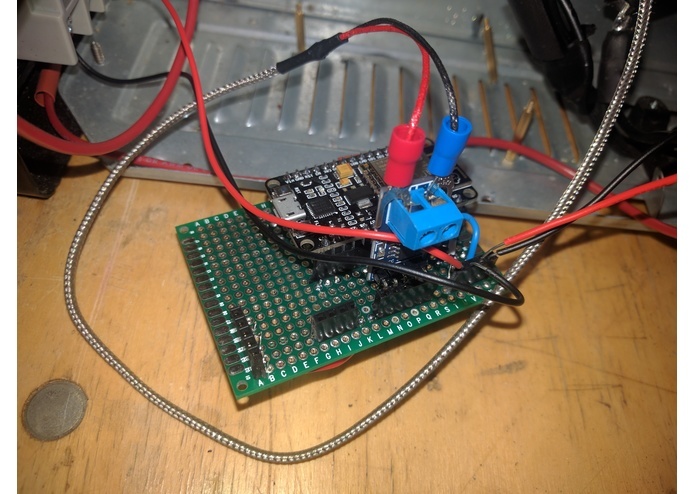 This micro-controller, paired with a high temperature thermocouple and solid state relays allow the oven to accurately control the temperature inside the unit. 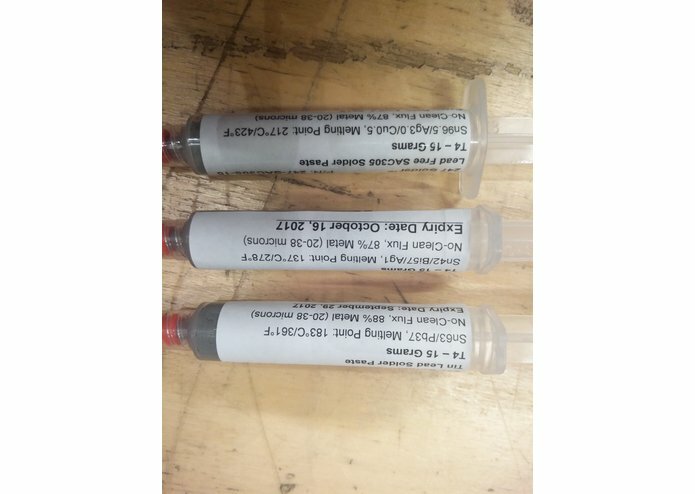 With the ability to control the temperature of the oven with a micro-controller, we are able to have the oven follow industry standard solder reflow temperature curves for three different types of solder paste; leaded, lead-free, and lead-free low-temperature. A reflow oven is used to solder multiple surface mount circuit board components at one time. The surface mount components are all arranged appropriately on the board with a liquid solder paste adhering them to the board. The whole board is then placed in the reflow oven and put through a heat profile set up for the specific type of solder paste used. When the oven reaches its terminal temperature the solder paste melts, then once cooled it solidifies, creating a solid weld between the component and the board. 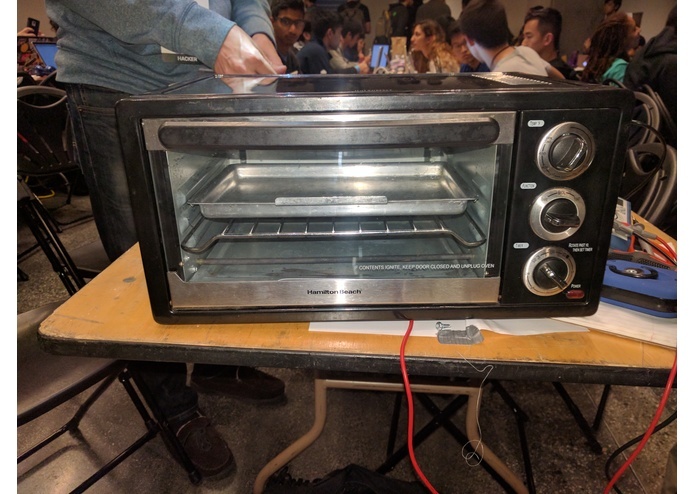 We bought a toaster on Craigslist for $20 a couple of hours before CalHacks. This oven was then disassembled, removing all of the analog controls, leaving us with a metal box with four quartz heating elements rated to draw up to 1300 watts. The elements being quartz are important part of a good home reflow oven. They create a more even heat and don't heat up black components nearly as much as infrared heating elements. We then controlled the heating elements with two solid state relays. This allowed us to turn on and off the heating elements quickly to control the temperature. The temperature sensing was done with a k-type thermocouple which can read temperatures up to 1400 degrees Celsius. While our oven will never get that hot, it is nice to know that we won't hit an upper limit on temperature when reflowing which could happen with other types of temperature sensors. This was our first time using this particular micro controller and tool chain and we had many delays in getting our software project started. Our original plan for the hack was to utilize the onboard wifi on the e8266 to create a webpage that allows for custom profiles to be set for each of the solder types. While this was not achieved in the final product, we have learn a great deal on how web servers work on small devices with very little resources. 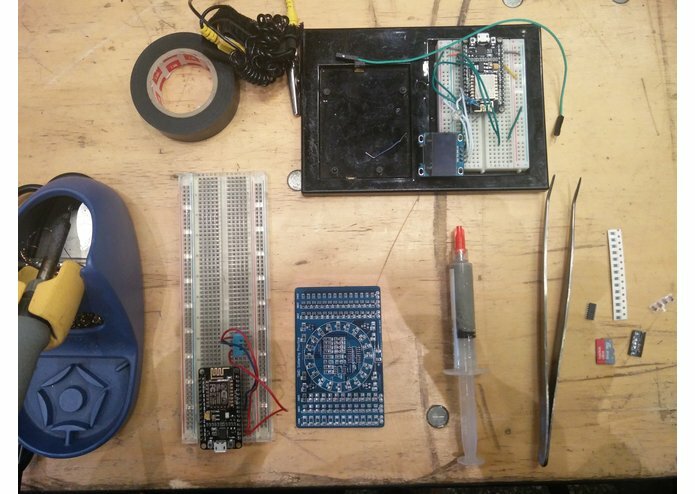 We also purposely went into this hack without any centerpiece with the ESP8266 because we thought that this would be a great venue to try out the $4 micro controller with WiFi that the hacker community has be raving about for over two years now. 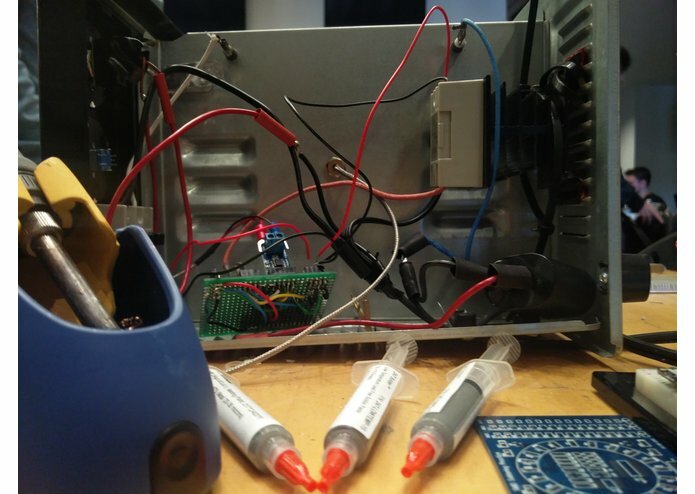 In hindsight, we probably should have done some quick little projects to familiarize ourselves with the chip before attempting to complete an extensive hardware hack as well as software hack all in 36 hours. While we did finish the hardware hack and had software written to test it, we weren't allowed to test our device here at Calhacks. There were concerns that the oven would draw too much power and blow a circuit. We felt that this was fair, but we are sad that we were unable to test the small amount of software we wrote for the oven. Some of the other challenges we ran into were time management. We didn't realize how long it would actually take to take apart the oven, and put our components into the inside of it. We also underestimated how much time it would take to setup a working development environment for our software. 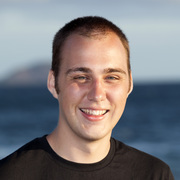 We started using GitHub's Atom IDE with PlatformIO for their rumored great support for the ESP8266. We quickly realized that this environment was built more for professionals, and wouldn't cater well to our method of rapid development, which was more of a copy and paste anything we could find to increase our speed of development. We ultimately had to step down to the Arduino IDE which was more simplistic, but had a much larger supply of library that will work with almost no modification. We plan to fully implement all of the features we set out to accomplish here at Calhacks, but on a longer time line with more sleep and less noise. We are planning to build and test reflow profiles for each of the different solder pastes available. This hack, while not complete at the end of Calhacks, will have a long life ahead of it. 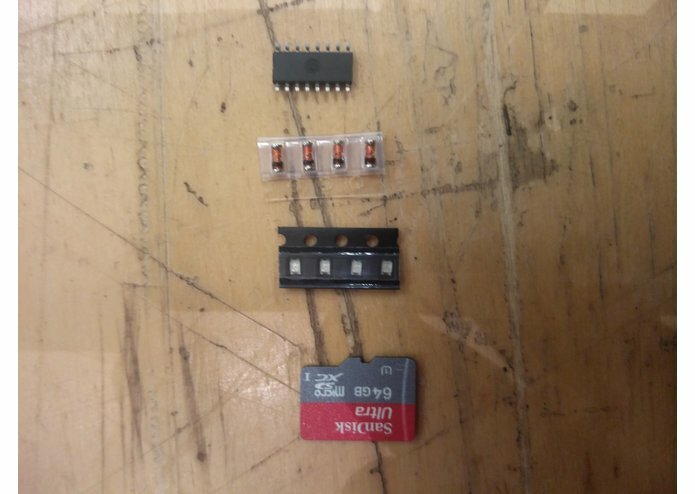 We are planning on using it for some projects that we have been putting off for a while because of the amount of hand SMT soldering that would be required. I worked on the code to interface the ESP8266 to the Toaster Reflow Oven, as well as assisting in the design and implementation for the protoboard. I helped wire the oven, solder the boards, and debug the code. Work on developing the interface that was implement in a .ino file. Also try to implement DHT11 Sensor that would keep track of the temperature. Learn a lot about ESP8266 development board and arduino .